Press Eye - Belfast - Northern Ireland - 03rd August 2016 - Photo by William Cherry Pictured at the launch of the Danske Bank Premiership are Kevin Kingston, CEO of Danske Bank and players from each of the 12 league teams. The launch was held at the National Stadium at Windsor Park. Coleraine Football Club could have been forgiven for thinking they weren’t invited to the big opening day party on Saturday. So much so that they had to organise their own party at The Showgrounds after being caught up in the latest saga to hit troubled Portadown. The Shamrock Park club were suspended from all football activities last Tuesday after the IFA found them to be in breach of Article 9.3 of the body’s disciplinary code. The news also had major implications for the Bannsdiers who were due to host Pat McGibbon’s side for the big kick off. In a bid to try and recoup some of the losses the board and management organised a family fun day and friendly. But an eleventh hour appeal by the Ports on Thursday to try and get the league game played put those plans on hold until the governing body ruled once and for all that the game was definitely off. “It has been a frustrating week for us all, we were just trying to get our heads around what was happening,” boss Oran Kearney told Times Sport. “Even when it was announced it was first off we had a full on 24 hours trying to put on the fun day for today, then to be told again on Thursday night that it might be back on again. 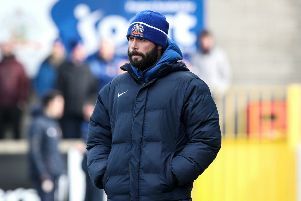 “I felt really guilty on Thursday when the word got out that it may still go ahead as we hadn’t really prepared for the game if it was to go ahead. “We had nearly taken our eye off the ball trying to arrange something else to take the place of the game so as to generate some funds for the club. “It has been a topsy turvy week and not the most enjoyable, and to be honest not the one we would have wanted. Coleraine did manage to get a game on Saturday as they entertained Intermediate League side Trojans. In the first half they looked like a side who were still disappointed to be missing out - and rightfully so. But they imroved after the break upped their game . James McLaughlin cancelled out Marty Smith’s first half goal, before Gareth McConaghie grabbed his first goal for the club. A Neil McCafferty penalty, a Jamie McGonigle tap in and another for McLaughlin wrapped up the scoring for the home side. “Yeah the first half was a bit sluggish, and probably rightfully so after the week it has been,” said Kearney. “The first day of the new season is always a cracking day with great anticipation and excitement, but today it just looked like a bunch of disappointed players out there. “For the first 45 minutes they were nearly feeling sorry for themselves. “We had a few words at half time, nothing mad, and we kicked on in the second half and improved.